Of the many frustrations back pain patients face, the lack of a standardized or uniform treatment approach is high on the list. Especially for those patients with longer-lasting symptoms of sub-acute pain (lasting between six and twelve weeks) or longer than twelve weeks (chronic back pain), treatment approaches are very inconsistent. 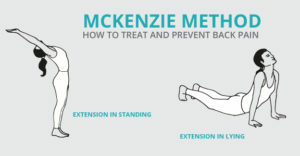 While the McKenzie Method is successful with treating acute low back pain, it is also very helpful for those patients with sub-acute and chronic back pain. One of the benefits of the McKenzie Method (or McKenzie Therapy) is that it is a standardized approach to both the assessment and treatment of low back pain and/or leg pain (sciatica). The McKenzie Method is not simply a set of exercises; it is a defined algorithm that serves to classify the spinal problem so that it can be adequately treated. The McKenzie Method is grounded in finding a cause and effect relationship between the positions the patient usually assumes while sitting, standing, or moving, and the generation of pain as a result of those positions or activities. The therapeutic approach requires a patient to move through a series of activities and test movements to gauge the patient’s pain response. The approach then uses that information to develop an exercise protocol designed to centralize or alleviate the pain. While there are certainly other forms and schools of physical therapy, this article discusses the components of the McKenzie assessment and classification system, and summarizes the experience of a typical patient whose pain classification reflects that he or she would benefit from McKenzie exercises. When a patient’s pain symptoms can be made better or worse by adopting various, differentiated active positions, it is said that a patient has a directional preference of movement for treatment. The identification of a directional preference through mechanical means is the hallmark of the McKenzie Method (which is often referred to Mechanical Diagnosis and Therapy or MDT). The patient’s beneficial ‘directional preference’ also is the direction of movement that causes pain symptoms to move more centrally (toward the mid-back or neck), where they are generally better tolerated than if the pain were to remain in the legs, hips, or low back. Continue reading the full article from Thomas E. (Ted) Dreisinger, PhD on Spine Health here.